Install ye dependencies needed t' compile. Ye may have t' install perl gcc make automake libtool autoconf m4. If ye want t' compile from x86_64 ye, ight have t' install gcc-multilib. Steer ye ship to the port in which ye wish to rest or repair PocketMine-MP. Order ye crew as shown below. They'll be digging up PocketMine-MP and t' PHP binaries, or pillaging them from the nearest ship if ye found none. Run t' ./start.sh, and ye PocketMine-MP will set sail. At t' moment only iOS devices with thar sea legs can run PocketMine-MP. Put no limits t' ye imagination. Control all aspects o' gameplay. T' set up ye ship ye need a hardworking crew. In t' chest where PocketMine-MP be hidden, open t' server.properties map with ye text editor. Ye can check all t' settin's and t' values on t' server.properties tavern on t' Island. If you be settin' up PocketMine-MP on a home network, you have t' port fore t' PocketMine-MP UDP (and TCP if using RCON) port on your router. If you don't know how t' do port-forein' go t' Port Forward, search your router, and follow t' instructions. 4. Lastly add ye doodads! T' extend t' features o' PocketMine-MP, you can add Plugins t' get new features, or modify already existent ones. Before askin' anythin', ye read th' Frequently Asked Questions page and the Wiki. That solve th' majority 'o th' questions. T' Tavern: Join ye ship, ask ye landlubbers, look for plugins, me boy! IRC: Direct chat. 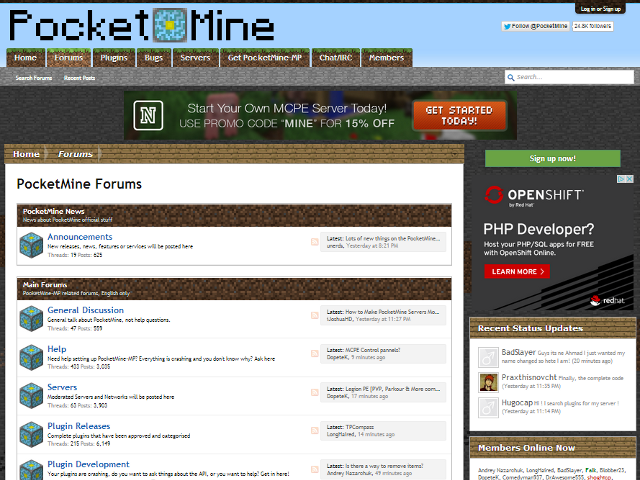 #pocketmine (or #mcpedevs) @ irc.freenode.net, or use t' WebIRC. Ye direct e-parrot adresse: Contact at [email protected], [email protected], [email protected], [email protected] Only urgent thin's, for normal questions use one o' t' methods above. Irrelevant messages will be deleted. Extend ye voyage how ever ye darn feel like it, add more cannons! Send multiple ships at once, and travel afts and forth. Teleport playerrs, whitelist thou server, tune ye server, Remote Consoole. Get all ye scallywags in a single ship. Er run a open bar. Endless booties, and we always be adding more cannons. Shoot ye wings, booty frauds, cowards running away & moar. With a fancy switch. All projects and services from PocketMine be provided free o' charge. If you liked our project, we ask you t' donate t' PocketMine. 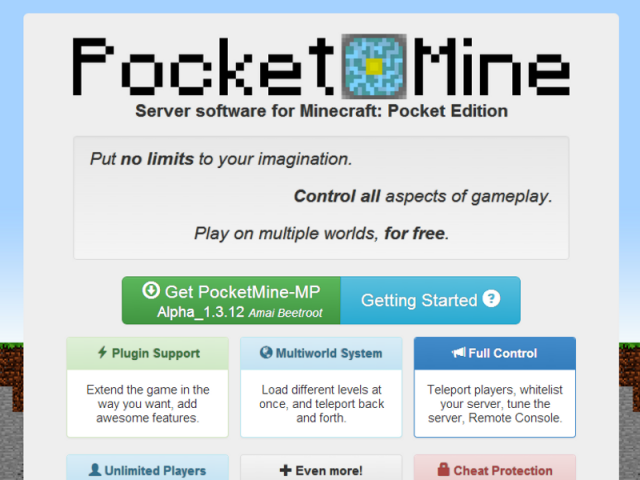 All donations will be used t' cover server costs, services and software licensin', and only for PocketMine. Log of given doubloons - How do we use t' doubloons - Aid ye people on github.